There’s no better thing than online shopping. Long waiting in lines finally come to an end, and if the purchase includes a form of fun, then it is a safe place for each of you. 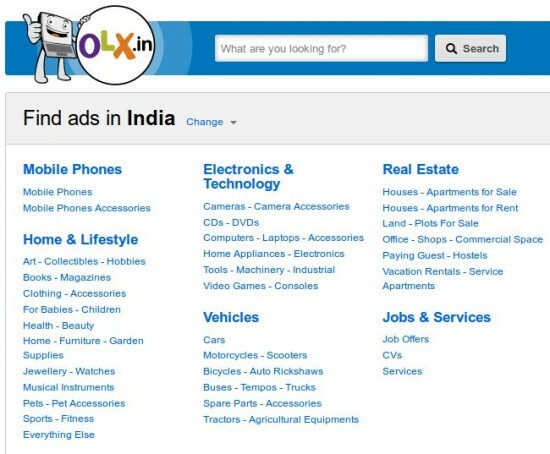 Today we pay a closer attention to free online platform of India classifieds named OLX. It’s a free online platform of classifieds, currently working in India, and it offers a wide range of services, from education and jobs as well as the buying and selling of all type of products. OLX is the next generation of free online classifieds. This site is the one of the most popular web destination in that part of the World, and now they are taking the World. The site was started back in 2006 and these days it is the largest place in Indian as well as worldwide where you can find almost every products and services. There are no obstacles when we are speaking about your location, so you can sell you stuff globally, no matter where is buyer’s location. OLX is definitely the place to buy or sell almost everything in fastest and most effective possible way. Along buy and selling, there’s also a wide range of services such as jobs, matrimonial, real estates, communities and classes. They offer services in 40 different world languages, and in almost hundred countries all over the World. Like the most of the biggest companies, OLX recognized television as best medium to speak with costumers. In only couple of months their commercials become viral, because of the aspiring humor as well as the way in which they are skillfully designed. Their catchy slogan “Where Buyers Meet Sellers” is the best way to describe their field of work. Along many interesting TV commercials that came from OLX I’ve picked two of them which caught my eye. First of them is “Neighbour’s Envy”, and describes the envy of neighbours in a very picturesque way with endless question – which has bigger one? Husband and wife wait in bushes till their neighbours goes to sleep to measure their new car, and because is the bigger then theirs, they immediately put classified ad for selling on OLX, and sell the car in matter of minutes. Second commercial which caught my eye is “Old Promise”. One more time we have husband and wife couple, only this time it’s about selling motorbike on OLX. Again they instantly struck chord with ad, and the counter on YouTube is way over million viewers. So, there’s needless to say that they are having some of the most popular television ads currently being aired in India. You will literally find hundreds of thousands classified ads. Your eyes will find everything you’ll every want and more. OLX is also a great tool for social networking, so you can very easy find a new job, hire people, and meet some brand new friends in the process. So, we are not only speaking about online shopping site, but kind of community where’s a lot of things happening.